★ Size:11.81*11.42 inch; 11.02*9.45 inch; 10.23*7.48 inch; 9.45*5.5 inch.Metal construction. 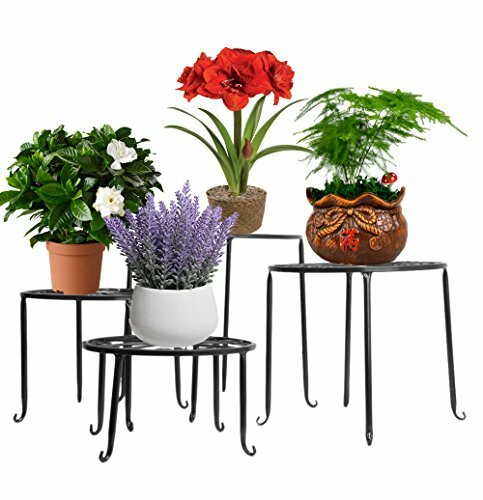 Beautiful scroll work design,very solid and sturdy.Sturdy metal material can hold different kinds of the potted plants. Beautiful design potted stand for home and gardening fans. ★ **Attention:Please keep the flower pot in the middle of the stand rack, or will cause the stand rack fall down & damage to the flower frame's leg & hurt yourself!!! ★ You could place the planter in your front door or your window and everyone will see it on it they come to visit. ★ A great home and garden decor item - makes a great gift for your favorite gardener. ★ 6" 8" 10" 12" four size in hight make the potted well arranged more artistic.